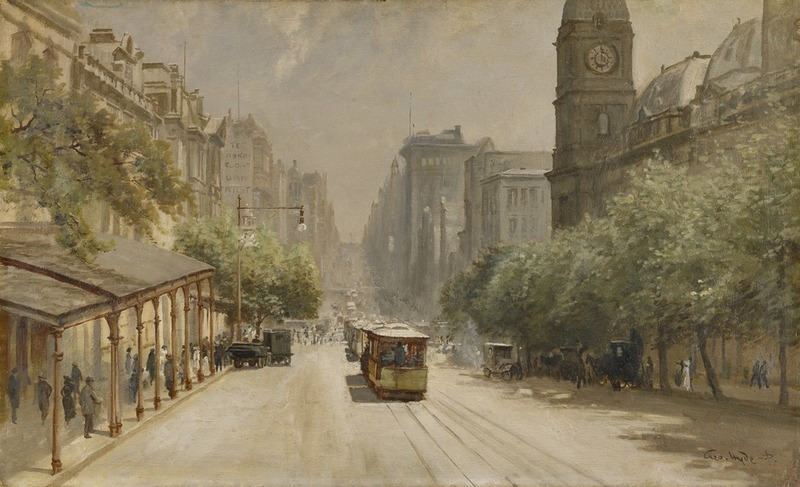 Collins Street painting by George Hyde Pownall circa 1912. Welcome to our Hotel Melbourne History series of blogs, take a step back in time and meet some of the characters and places that make up the colourful, interesting and sometimes surprising past of our hotel and our heritage building. In this first edition, let’s set the scene and learn some key facts that will shape the stories that are to come. Our story begins somewhere in the late 1800s. Have you noticed that the hotel was once two separate buildings? What we refer to as the Rialto wing and Winfield wings of the hotel were once the Rialto building and Winfield building (or Wool Exchange building as it was first known) which were first designed in 1890 and 1891 respectively. What was Melbourne like then? Firstly, let’s go back a decade to the 1880s which were a glorious time for the city. This period is remembered as Marvellous Melbourne when the city was the centre of radical improvement as money and development poured into Melbourne in the form of stunning architecture and rapid expansion. This glory time for the city did not last forever and by the 1890s financial times were harder and this headlong rush into decadence and growth slowed. But what was left was a city with a bustling commercial hub which rivalled large European cities at the time and a featured ornate office buildings up to 12 storeys high. It was also around this time that trams were being introduced in Melbourne, the technology has constantly evolved over the years but this iconically Melbourne form of transportation was also taking roots at the close of the 1800s. So it wasn’t always a hotel? No, in fact, the hotel is a relatively modern use for the buildings. The first hotel in the space opened it’s doors to guests in 1984. Then in 2006, the management of the hotel was taken over by InterContinental Hotels Group. But we are getting ahead of ourselves, let’s take a step back in time again. The Rialto building was one of the finest examples of 19th-century Gothic architecture and was created with the latest technology and comforts at the time. The building housed office spaces on the higher floors, shops lower and basement warehouse space. The Winfield building was initially called the Wool Exchange until the 1920s and was, as the name suggests, the centre of Melbourne’s growing wool trading industry. Early tenants included wool brokers and merchants, skin merchants, printers, publishers and the Melbourne chilled butter company. But we will explore more of the characters over the course of this blog series. With nearly 140 years of Melbourne history here, there is a lot to take in, what are some of the key dates? Are you ready to be part of the story? We look forward to welcoming you to the hotel soon. Enjoy an indulgent weekend away with our Weekend Special package including breakfast and late check-out. Visit the offers page to find the perfect package and start planning your trip. 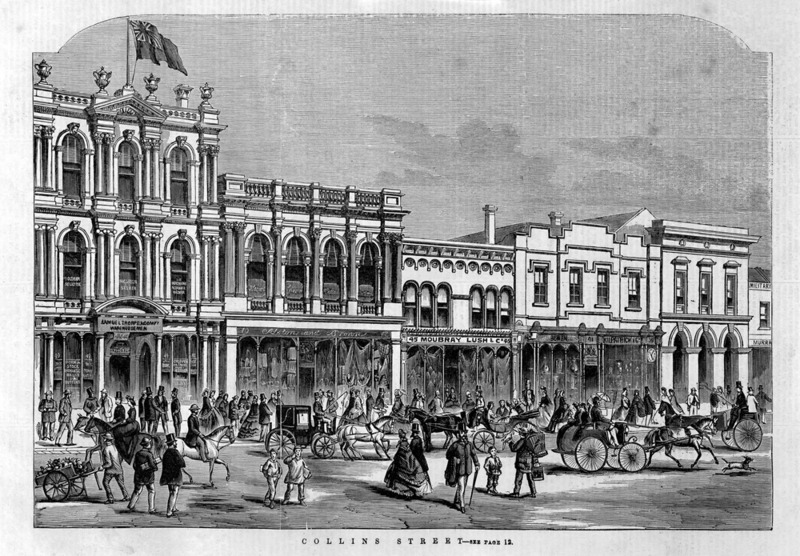 Collins Street Wood Engraving by P.T. Conlon, architect. circa 1864. 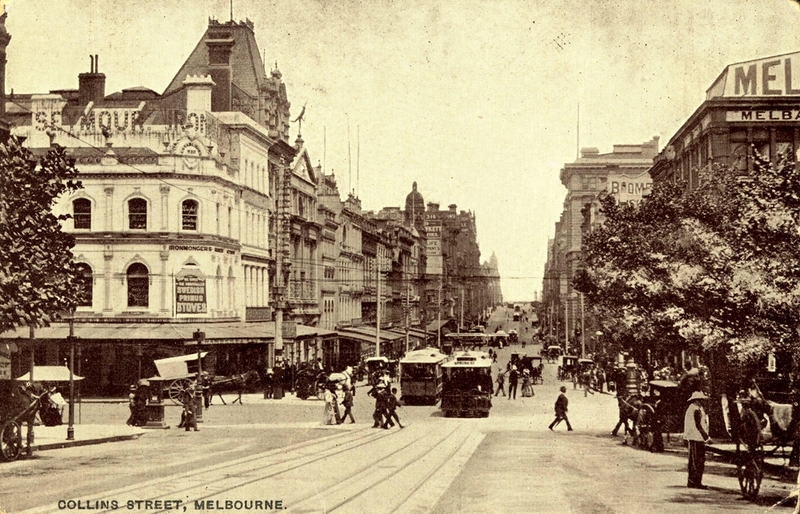 Historic images of Melbourne courtesy of the State Library of Victoria.